I'm sad to say this is my last Key West post... *insert frowny face here*. It's been nice being able to go through these pictures and "relive" my vacation again but it's finally come to an end. These pictures are from my last day in Key West when I went exploring up at Mallory Square super early in the morning. I have to admit, Mallory Square is definitely not nearly as interesting during the day as it is in the evening. But, the view is absolutely gorgeous. I definitely wouldn't complain about living in one of those huge houses that's for sure! For this outfit I really wanted to be as comfy as possible since I was going to be sitting in a car for 6 1/2 hours on the drive back. These are some of my favorite Hollister shorts because they're super soft and have a bit of stretch to them. It also makes them perfect for walking around in since they don't get too stretched out. I decided to wear this semi-sheer ikat tank because it's loose and flowy but still cool in the steamy weather. I love the neon accents around the neckline and shoulders which gives it a nice little pop of color. I got the Kate Spade crossbody the day before we left for vacation at the outlets on super sale! I'm not going to lie, usually I HATE going to the outlets but if you go on the right day you can score some awesome things! pretty!!! again, making me want to hit the beach asap! This is my kind of outfit! I pretty much love anything ikat patterned. Happy Monday, girl! love this all, so comfortable and cute! I love your top, especially the neon trim! Love that adorable tank! Too cute! Looks like the perfect outfit for exploring then hopping in the car for a long ride! Love that neon pop on your top! I am sooo jealous of that gorgeous location! I LOVE that crossbody bag and the pop of neon on your shirt. Key West sounds like fun right about now! I love the top! The photos look incredible! I love the neon accents on the tank! And that crossbody is too cute! Love the bright pop of color on this shirt, so pretty. 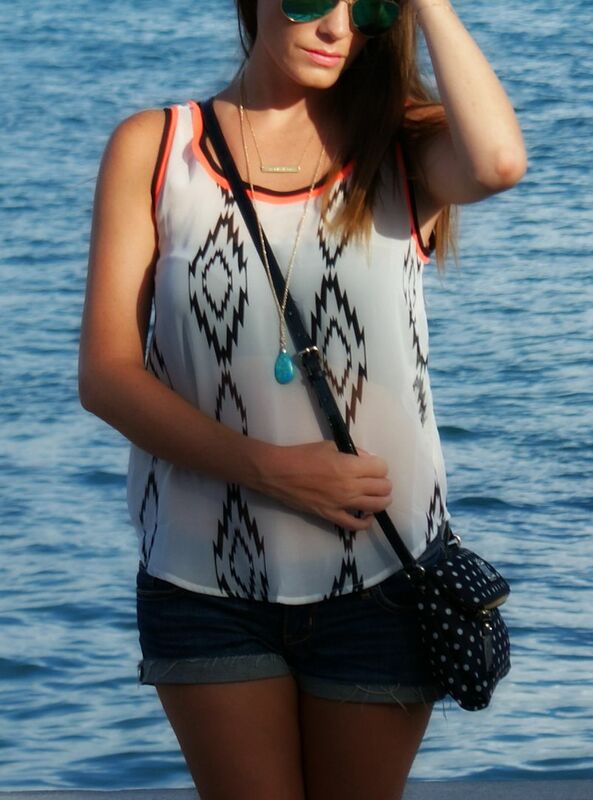 Love that cute ikat top and your mirrored ray-bans!! I'm dying for a trip to Key West soon! It looked like a blast. super cute tank!! xo jillian - stop by cornflake dreams, I'm hosting a giveaway! That top looks so light and breezy! Perfect for sweltering days! seriously your style!! love it! YES to Ikat - you know I love this! Super cute! One of my favorite prints of the season! Definitely my kind of outfit. Shorts and Flip flops = causal and comfortable. What a fun top!! LOVE the neon accent :) And that necklace is so cute--the color is amazing :) I am dying to get to Key West someday--looks like you had a blast the whole time! 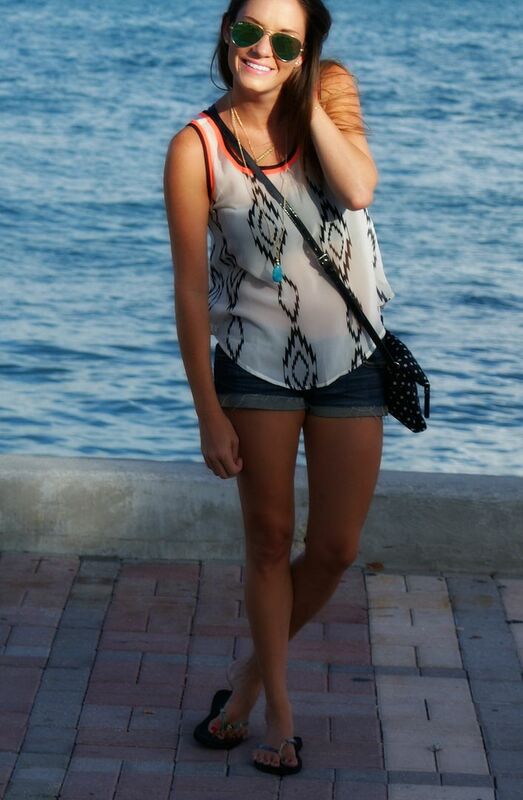 I have been loving your Key West pictures! So beautiful! Your top is adorable! You make me want to take a vacation all the time :) Cute tank! Loving the top and theres nothing better than a comfy pair of jean shorts. So cute! So cute! Love that tank. Hope you had a great weekend! That top is so pretty! 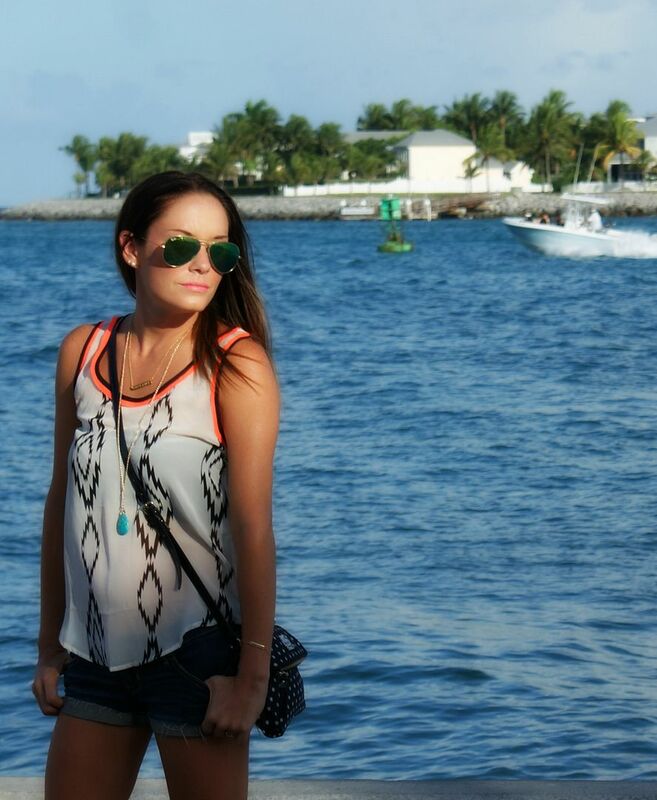 Key West makes for a perfect backdrop for these photos! That cross body is perfect for travel and I love the polka dots! You got some gorgeous pictures in down there! such a cute outfit! love the top + bag. Kate Spade is one of my faves! Love that wristlet! Love that outfit!! And I would definitely feel sad leaving Key West too! !